I've written before about disguising comfortable pants as work appropriate pants so you can imagine my excitement when I started seeing drawstring pants start popping up all over the place. 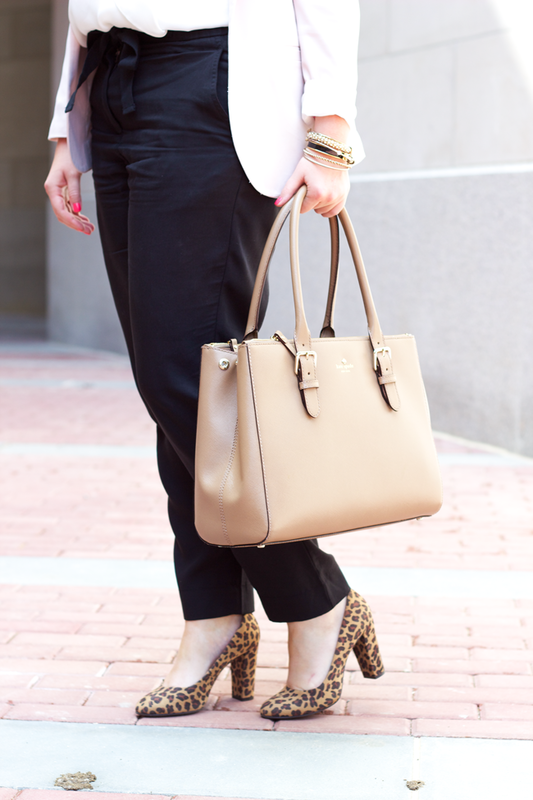 Lounge wear disguised as work pants and under $100? Pants I can dress up or dress down? Be still my heart. Since wearing these to work last week, I've a) cut my hair (!) and b) worn them with a white tank, my trusty jean jacket and favorite d'orsay flats. I’m planning on packing them to bring on my trip to SF next week and wearing them with a black top, faux leather jacket and some my strappy sandals (last seen here). Are you embracing the track pants trend? How are you wearing them? Have you seen these pants http://factory.jcrew.com/womens-clothing/pants/novelty/PRDOVR~A7893/A7893.jsp?color_name=black ? I feel like they're something you would like. It's a nice material, so you can wear them out with heels or in with a tee. I think I saw a patterned pair, too - maybe in clearance?